Gamet Bearings have been manufacturing high precision tapered roller bearings for over forty years in their Colchester factory. Originally founded to serve the machine tool industry, gamet has today expanded into other sectors of industry having high precision bearing requirements.These include the coating of materials, photographic emulsions or adhesives, and the printing and packaging industries. Ongoing investment in new equipment and technology will ensure the continuing reputation of gamet as a manufacturer of high precision, high quality bearings. Mounting should be undertaken in clean, dry, dust free conditions away from metal working or other operations producing swarf or dust. It is recommended that drawings and instructions are studied to determine the correct order of assembly. All necessary parts, tools and equipment should be available before commencing. Each component of the spindle arrangement (housing, shaft etc.) must be carefully cleaned and checked for burrs. Dimensional and form accuracy of all components in contact with the bearings should be checked as optimum bearing performance can only be achieved if the prescribed tolerances are adhered to. Bearings should remain in the original packaging for as long as possible prior to fitting to prevent the risk of contamination. 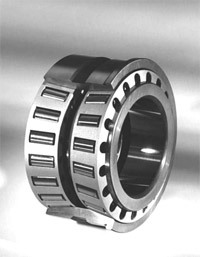 Whenever possible, bearings should be mounted onto the shaft in vertical position. It is very important that the correct method of mounting is chosen and that suitable equipment is used. 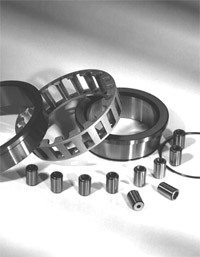 For specific advice contact gamet Bearings. Bearings must be correctly lubricated to reduce friction between the rolling elements and raceways. 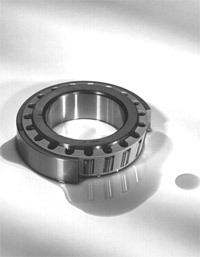 Lubrication will minimise wear and protect bearing surfaces against corrosion.The choice of a suitable lubricant and method of lubrication is very important and depends upon the operating conditions (temperature, range, speeds, loads, environment).A wide variety of greases and oils is available offering solutions for all applications. Oil lubrication is normally used where higher operating speeds are required as this offers more efficient heat dissipation. The selection of a suitable viscosity grade is important to optimise the life and performance of bearings and adjacent components. Filtration is strongly recommended as contaminated oil will have an adverse effect on bearing life and performance. Regular inspection of oil and filters is advised and changes made when necessary. Catalogue speed ratings are based on the use of oil lubrication. Higher specification grades offer improved radial run-outs and component roundness. gamet Bearings also offer a comprehensive service for the design and manufacture of other Tapered Roller Bearings to suit specific requirements.We will be pleased to offer our experience and technical expertise in assisting you to achieve the best possible results and maximise cost effectiveness, for all non-standard applications. bearing structure. Bearing speed ratings may reduce with grease lubrication. If you plan to use greased bearings, advice on maximum speeds can be obtained from gamet’s engineering department. 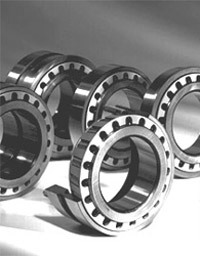 gamet Bearings offers a service of supplying bearings pregreased to suit your requirements. After installation bearings require a running-in phase to condition and match mating surfaces, this will ensure optimum performance.This is more critical when using grease lubrication as sufficient time is required to disperse and evenly distribute the lubricant within the bearing. If this is neglected, temperatures can rise rapidly causing localised overheating and lubricant break-down which can lead to premature bearing failure or inferior spindle performance. gamet Bearings offer advice relating to specific applications. gamet bearings consist of four basic components – the inner race (cone), the outer race (cup), tapered rollers and cage.The cone, ollers and cage form an assembly which is separable from the cup. 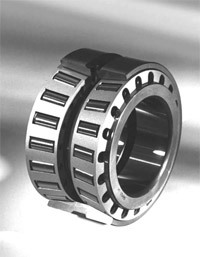 The geometry of tapered roller bearings provides certain unique features: most importantly, the long line contact between roller and race gives high load carrying capacity and high bearing stiffness.The ‘on apex’ design ensures a true rolling motion of the rollers on the raceways, at every point along the roller body. See Fig 1. In addition, the tapered construction allows the bearing to carry combinations of radial and thrust load.The small seating force (x) produced at the rib aligns the rollers to prevent skewing. See Fig 2. Roller Roundness and Calibration – A true roundness of rollers ensures equal load sharing within the bearing and contributes significantly to the overall precision of the bearings. gamet Rollers are ground between centres to achieve near perfect roundness. Rollers are then calibrated precisely into matched sets. Bearing Cage – The cage has a low coeficient of friction. It is guided on the inner race to provide radial stability and is designed to pass sufficient oil across the races to maintain lubrication, the remainder being diverted through the centre of the roller.Depending on rotational speed, grease lubrication may be used as an alternative to oil. 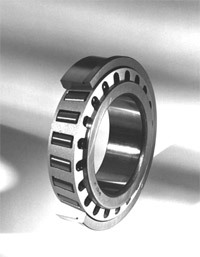 The basic single row bearing can be used in light to medium loaded applications, and provides a simple, costeffective arrangement. The flanged cup version enables through boring of the housing for simplicity and accuracy. Double row bearings offer nearly twice the capacity of the equivalent single row bearing, and are therefore used in more heavily loaded applications. The plain outer race enables this bearing to be used in a ‘floating’ position to permit thermal expansion. 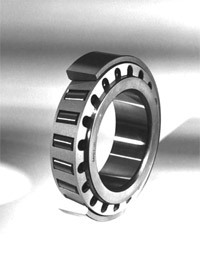 As such it can replace a P type bearing when additional load capacity is required. G type bearings can be preadjusted to give GE double row bearings.This is achieved by fitting a spacer between the inner races to give the required assembly end play or preload.The choice of setting is based upon a number of parameters such as speed, lubrication and applied loads. Spacer width is adjusted individually prior to despatch. For further advise contact gamet Bearings. 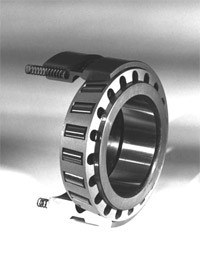 This double row bearing has a flanged outer ring which locates the shaft axially. This can also simplify housing machining operations and overall design. H type bearings can be preadjusted to give HE double row bearings.This is achieved by fitting a spacer between the inner races to give the required assembly end play or preload.The choice of setting is based upon a number of parameters such as speed, lubrication and applied loads. Spacer width is adjusted individually prior to despatch. For further advise contact gamet Bearings.